Purpose: To explain the differences between traditional, water-based fire sprinklers and chemical-based fire sprinklers for special hazards. What are traditional fire sprinklers? What are the advantages and disadvantages of water-based fire sprinklers? When should you use special hazard fire sprinklers? All fires are not created equal, which means that different environments require different types of fire protection to properly protect buildings, equipment, and people. For example, a traditional fire sprinkler system may work well in an office or warehouse. However, a data center filled with sensitive computer equipment would most likely suffer additional damage beyond that caused by the fire. This makes selecting the optimal fire protection system—or combination of systems—a critical part of your fire safety plan. What are traditional sprinkler systems? Traditional fire sprinkler systems utilize water as the fire suppression agent and have been around since the 1930s. Today, these systems are typically designed in a CAD system, and are often prefabricated prior to installation. They are manufactured to code at the local, state, and federal levels for fire safety. The cost of these systems varies depending on the size and type of environment to be protected, use of the facility, as well as the kind of piping set-up chosen; determined by pipe length, size, and meter size. Traditional sprinkler systems are an effective means of fire suppression ideally for rooms and buildings containing replaceable assets. There are a few advantages of employing a traditional sprinkler system. The use of water is the greatest advantage due to its environmentally safe qualities. The second advantage involves the automatic activation of the system upon detection, which enables fire threats to be extinguished quickly and effectively, mitigating damage, injuries, and death. Related: Top 5 Fire Sprinkler Test Videos on F.E. Moran Special Hazard Systems TV. Although non-toxic, a major disadvantage of using water is its corrosive and conductive nature. If your environment contains sensitive components and equipment, a traditional sprinkler system has a high chance of destroying critical assets. Another drawback of this system involves the financial and operational costs that are associated with a triggered event. What are special hazard fire suppression systems? Not every situation and environment can be properly protected through a one-size-fits-all­ mentality. 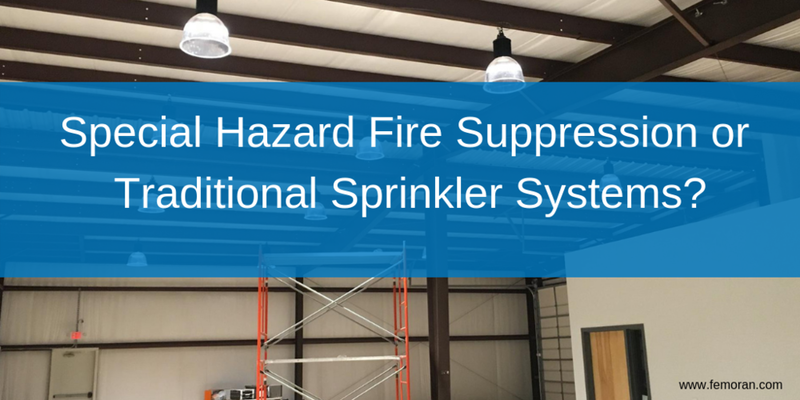 Special hazards fire suppression systems are designed to fill in the gaps left by traditional water-based sprinkler systems. These systems leverage different technologies, setups, and suppression agents to efficiently and effectively neutralize fire threats at a moment’s notice. Cutting-edge advances in detection technology enable fast and accurate detection of smoke particles using specialized sensors and computer algorithms. When triggered, the system is then able to decipher the precise location of the threat and neutralize it within ten seconds. There are numerous software programs and hardware add-ons that can be used to engineer safer and more effective systems that are more precisely tailored to your environment and circumstances. Through state-of-the-art video analytics software, special hazard fire suppression systems can also detect intrusions. They are being installed with a closed-network of cameras alongside fire suppression systems to enable real-time visual control over the facility during emergencies. In recent years, new clean agents have begun replacing old means of fire suppression such as Halon, a highly-effective but ozone-depleting compound that found its start in the 1960s. Today, clean agents such as FM-200 can neutralize a fire threat with smaller quantities of suppression agent while containing zero ozone depleting properties. Foam-based agents for environments with high ceilings, large amounts of airflow, and sensitive equipment such as aircraft hangars have also made significant advancements. One of the biggest advantages which special hazard fire suppression systems have enabled is that of early warning fire detection. Due to the advances in technology, specialized systems can detect smoke or fire quickly, neutralizing the threat, mitigating damage, and protecting personnel. This saves time from unnecessary work-stoppages and reduces costs due to excessive clean-ups. The different choice of fire suppression agents demonstrates yet another advantage of these systems. Dupont FE-25 clean agent utilizes a special compound that increases efficiency by 15-25% and reduces agent expenditure by 20-28% over other industry-leading agents. Not only does this allow for fire suppression to occur efficiently but is also cost-effective and non-toxic to the environment. There are some disadvantages associated with special hazard fire protection systems, though. Some parts must be replaced after each triggered event, storage tanks for the suppression agent must be refilled, and the additional technology involved can become costly. It’s important to determine if the risk outweighs the costs. Regardless of whether you choose a traditional fire sprinkler system, special hazards system, or a combination of the two, it is imperative that you first understand the strengths and weaknesses, as well as the impact of your choice. You want a system that not only protects your facilities, equipment, and personnel quickly and efficiently, while minimizing water damage and cleanup costs.